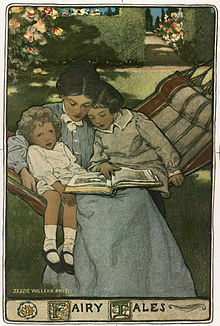 A mother reads to her children, drawn by Jessie Willcox Smith in a cover illustration of a volume of fairy tales written in the mid to late 19th century. Children's literature refers to books written for children and young people. Many famous authors wrote for children including Beatrix Potter, Dr. Seuss, A.A. Milne, J. M. Barrie, Edith Nesbit, Enid Blyton, Lewis Carroll, JRR Tolkien and C. S. Lewis. The Newbery Medal is an award given to writers for children. Children's literature can be divided into several categories, but it is most easily categorised by genre or the intended age of the reader. An example of a classification based on age is young-adult fiction, which is written for children between the ages of 12 and 18. A literary genre is the style of the book. It also refers to the technique, tone, content, or length. Picture books, including books that teach the alphabet or counting for example. They either have very few words or none at all. Many children's books are meant to teach children the consequences of engaging in "bad" behaviour, such as running away, stealing and lying. Tom Sawyer and Toby Tyler are two notable examples of the genre. This page was last changed on 28 October 2013, at 02:58.